Deb's Cup of Tea: Will They Work? I still clean a bit here and there, tossing things into a give away pile which is growing more massive as the weeks pass. I really need one of the veterans groups to call me for donations, mainly so I can start all over making a pile. While going through the closet in my bedroom, I found these items. I remember when Carole and I were going to use these for Halloween costumes. I hesitate to guess how old they are. So, I wonder, would they still work? I know it's a "simple" chemical reaction that happens when you apply pressure to the item which makes it glow. I wonder if the potential for that chemical reaction diminishes over time. Can these be stored indefinitely? At BlizzCon, Liz had glow bracelets for us to wear. She got 100 of them for $10 on Amazon. Ashley and I had great fun looking through the colors and deciding which ones went with our outfits. 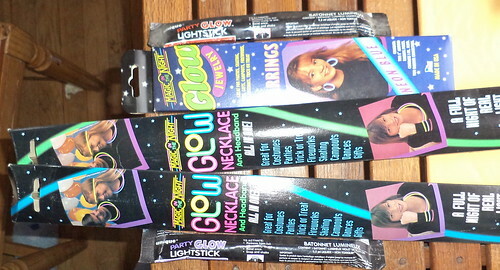 I don't have a reason to wear these so I don't want to "crack" them to make the glow, just to see. If it still works, I've lost one item. Guess I'll just hang onto them and maybe wear them to the opening night of the World of Warcraft movie in June.